The result of the election will impact on employment law. Each of the three main political parties is proposing distinct policies – do you know what they are and how they will affect your business or social enterprise? 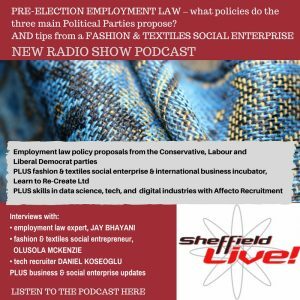 Jay Bhayani does, and she gave me a pre-election run through of employment law policy proposals from the Conservative, Labour and Liberal Democrat parties on my radio show on Friday. Listen to the podcast below. Also on the show: Olusola McKenzie describing how determination, consistency and flexibility are the key factors which helped achieve her vision. Olusola is founder of Learn to Re-create Ltd, a fashion and textiles social enterprise. Learn to Re-create runs an international incubation programme and launched a fashion collection last year, and Olusola’s team are now working on their second. Olusola popped into the Sheffield Live radio studio on Friday for a chat about what her business does, why and how they do it, and challenges they have overcome. The programme also features an interview with Daniel Koseoglu, managing director of Affecto Recruitment, with an update on skills and recruiting talent in the tech, data science and digital industries. 44:09 – 46:58 wrapping up and a final word from Learn to Re-Create.